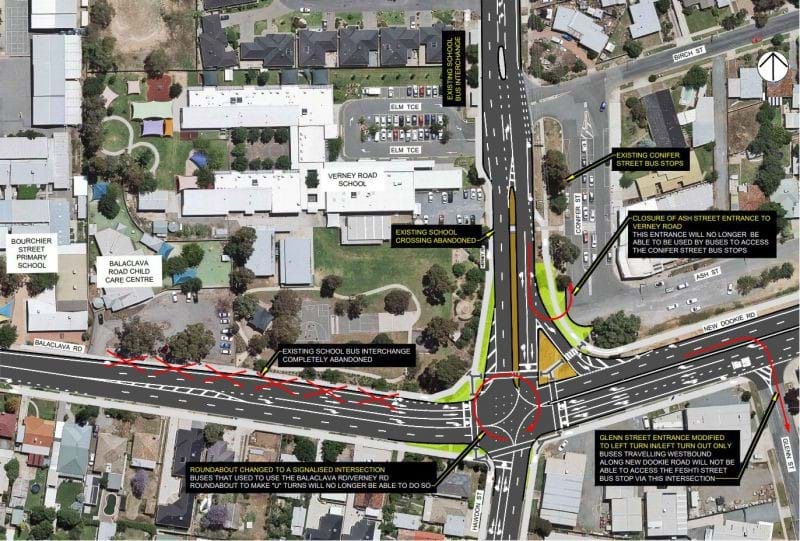 Greater Shepparton City Council is pleased to advise service relocation works are commencing at the Balaclava / Verney / New Dookie Roads / Hawdon Street intersection to make way for the much needed upgrade of the intersection with water main relocation works scheduled to begin on Monday 11 February. A number of water mains in the vicinity of this intersection must be relocated to allow for its conversion to a signalized intersection that will improve traffic flow and reduce congestion. Businesses in the area will trade as normal throughout the project and access will be maintained to all residential properties and businesses within the precinct throughout the works. Contractors will be onsite locating services from Monday 11 February and construction works will follow commencing with works on water mains on New Dookie Road and Balaclava Road. Works on water mains in Verney Road and Hawdon Street will follow. Lane closures requiring detours through adjacent streets will be in effect for some stages of the works in conjunction with restrictions to on-street parking. Heavy vehicle detours via Wheeler Street for west bound traffic will be used when required to facilitate works and reduce congestion. Council advises residents and commuters to plan ahead and be alert to changed traffic conditions. Council also requests that you observe signage and take extra care when commuting in this area. Greater Shepparton City Council Director Infrastructure Phil Hoare said these works will result in some disruptions and inconvenience however the works are essential to provide longer term benefits for the whole community through improved traffic flow and safety at this busy intersection and to cater for the projected growth in traffic volumes. “The water main works are a critical component of the pre-work to allow for the upgrade of the intersection. We are working closely with Regional Roads Victoria, Goulburn Valley Water and local residents and business owners in order to ensure the works are undertaken in the best possible way,” Mr Hoare said. For information and project updates visit Council’s website.